Re: Boss GT1000 Available now at GuitarCenter and Musiciansfriend. Boss GT1000 Available now at GuitarCenter and Musiciansfriend ?! http://talk.philmusic.com/index.php?topic=347091.msg4826488#msg4826488 << oi tamod ni petrucci dito mo ipost yan nakapagpost ka na dito di ba? sentido komon mo ba nag bakasyon din? The STOMPBOX data was not correctly take over to GT-1000 system program Ver.2.00 from previous version. Please refer to the "GT-1000 Parameter Guide" for detailed information in the [ Owner's Manuals ]. TYPE settings have been added to effects as described below. * Preset patches that use the added TYPE settings are contained in P47-1 through P49-5. 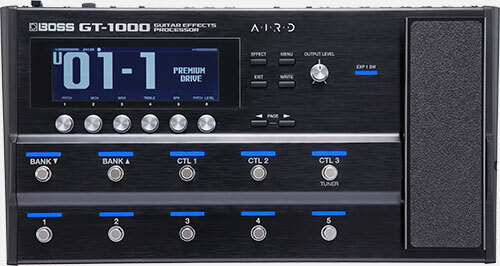 For details, refer to "GT-1000 Sound List." A level meter was added to the INPUT LEVEL setting screen. Set the input level so that the input-level peak is positioned at the △ symbol. At the Play screen, a function that allows direct editing has been added to the "Show functions assigned to main unit and external switches" screen. Press the PAGE [ < ] and [ > ] buttons at the same time to start editing. Turn the [ 6 ] knob to select the switch to edit. Press the [ 6 ] knob to move to the function selection screen. Turn the [ 6 ] knob to select a function. Press the [ 6 ] knob to confirm the selected function. Press the PAGE [ < ] and [ > ] buttons at the same time to quit editing. A CURRENT NUMBER pedal LED setting and automatic setting function were added. A TIME parameter was added to TYPE: WARP for MASTER DELAY. This lets you adjust the speed of change. The METRONOME can now also be turned ON or OFF using press the knob. When BPM or DELAY TIME has been selected using the KNOB SETTING, the setting value can now also be changed by operating press the knob. The detecting accuracy of the monophonic tuner has been improved. The arrangement of MENU items has been improved. The EFFECT LEVEL value for MASTER DELAY to fall under certain conditions was corrected. Use the most up-to-date versions in combination, as described below. * For the app, install the latest version from here. Use "BTS for GT-1000," which supports GT-1000 version 2.02. * Download the app here. If you want to keep backed-up data saved to the app using GT-1000 version 1.11 or earlier, follow the steps below to back up the data to the cloud before updating your GT-1000 system program to version 2.02. You can then use GT-1000 version 2.02 to restore the backed-up data. * When performing the backup, use the older version of the app (Ver.1.0.4). * When specifying where in the cloud to save the data, select iCloud Drive if you're using an iOS device or Google Drive if you're using an Android device. Tap [CLOUD], then tap the [NEXT] button. Select the LIVE SET to save to the cloud, then tap the [EXPORT] button. The screen for the cloud is displayed. Select the destination for saving to the cloud, then carry out the backup. * The backup of STOMPBOX SETTING data is carried out via the GT-1000, and so performing the procedure described below erases the STOMPBOX SETTING data currently saved on the GT-1000. To save the current settings, before you execute the backup, carry out the steps in the sequence of 1 -> 2 -> 5 -> 6 to save the data. Tap the [STOMBOX DATA BACKUP] button. At RESTORE, go to "FROM FILE" and select the data you want to back up, then restore it to the not-yet-updated GT-1000. Wait for the message "COMPLETED!" to appear. At BACKUP, tap "TO CLOUD", then export the data. * The ALL DATA BACKUP operation is carried out via the GT-1000, and so performing the procedure described below erases all settings currently saved on the GT-1000. To save the current settings, before you execute the backup, carry out the steps in the sequence of 1 -> 2 -> 5 -> 6 to save the data. Tap the [ALL DATA BACKUP] button. * Processing requires considerable time. Before you start, check the system program version of your GT-1000. While holding down [ EXIT ] button, turn power ON. Continue to hold down EXIT until the GT-1000 logo appears on the display. After a short while, the version information appears on the display. If this shows the latest version (Version 2.02 or later), there's no need to update your GT-1000. After verifying the displayed version, turn off the power. Even if PATCH EXCHANGE is done, patches will not be replaced. Bad Behavior has blocked 46738 access attempts in the last 7 days.